14-18 November – anti – bullying week. The limited studies in South Africa, that have been conducted show that bullying is prevalent in our country. One in five teens have experienced bullying firsthand at school or through social media, and over 80% know peers that go through it regularly. Even though these statistics are very few and some not even a year old, we cannot ignore the fact that our youth are being bullied at home, at school and on social media. Too often bullying is brushed off as something that “just happens”, but it is a lot more serious than that. From the 14th-18th November the world focuses on bullying during the anti-bullying week. The focus this year is on encouraging all children, youth, teachers and parents to take action against bullying not only in this week but throughout the year. As Scouts it is our duty to be a brother to all other scouts, respectful, courteous and a friend to all. It is our role to lead by example and to help by speaking out to our peers and adults when we or a peer are being bullied by others. Bullying can be verbal, emotional or physical and can happen at home, at school, at a sport club, online through social media platforms, or among friends. The harmful effect of being bullied doesn’t end when school is over, the Facebook account closed or the Tweet is deleted. It has been shown that it has long-lasting negative effects for the victims. Gestures, words, acts, or a photo is more than enough to psychologically damage a person for life. It’s important to remember that bullies don’t only break down a person’s self-esteem, they make them feel less of a person, fearful and even embarrassed to be themselves. It is time for us as Scouts to take a stand and act to stop bullying around us. All it takes its one person to stand up for themselves or others by talking to an adult you trust. The BBC recently covered a study that was done by researchers from Edinburgh and Glasgow universities in the UK. 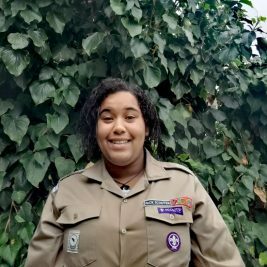 After studying 10,000 people they found that ex-Scouting members were 15% less likely than other adults to suffer anxiety or mood disorders at the age of 50. The researchers believe it could be the lessons in resilience and resolve that Scouting teaches that has a lasting positive impact on its members. This underlines the power the Scouting programme has on our young members but also our responsibility to use our Scouting values and ethos for good to help others live happy and healthy lives. Let us make the difference and show our support to stop bullying nationwide. If you are being bullied and feel trapped, remember that there are peers and adults in your life who are there to support you. Talk to your parents, older siblings, teacher, Scouter, or adult helper so they can help you. Are you an adult volunteer and a child has come to you for help? SCOUTS South Africa’s Child Protection Policy & reporting procedures. If you are looking for more information you can also look at the Childline South Africa Anti-Bullying Information Page.